A furnace is a very important feature in any home because a furnace is responsible for heating the air in the home and keeping the home at a comfortable temperature during the winter months. Some furnaces are powered by gas, and others are powered by either oil or electricity. All furnaces require regular maintenance, in addition to residential HVAC maintenance, to keep them working safely and efficiently. As part of your heating system, a gas furnace takes in cold air, cleans it with an air filter, heats it up with a gas burner using a steel heat exchanger, and then distributes the warm air with a blower through your home’s ductwork. There are many things that can go wrong with a gas furnace. Problems such as improper venting or a hole in the heat exchanger can be dangerous if not detected and repaired. Improper venting or a hole in the heat exchanger can lead to carbon monoxide poisoning. Carbon monoxide poisoning is responsible for many deaths in the United States each year. It is particularly dangerous and is referred to as a “silent killer” because you cannot see it or smell it. The only way to make sure your furnace is not emitting dangerous levels of carbon monoxide is to have it checked regularly by a reputable HVAC technician. 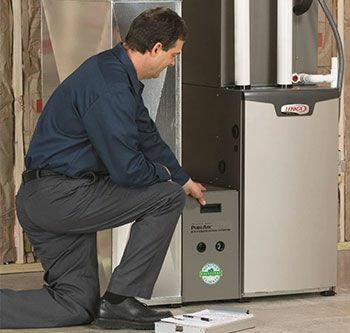 You can trust the experts at Climatesmith to inspect your furnace and to make any needed repairs. We are a customer-focused heating and air conditioning company providing all HVAC services located in Alpharetta, Georgia. Our well-trained professionals are experts in all types and brands of furnaces. If your current furnace is at the end of its life or just needs to be replaced with a more efficient model, we can help with this too. Furnaces come is different efficiencies measured in AFUE. AFUE stands for annual fuel utilization efficiency. Units with higher AFUE ratings are more efficient than units with lower AFUE ratings. Replacing an old furnace with a newer, more efficient model is a great way to save on utility bills. If you are in need of a new furnace, or if your current furnace needs repairs, please contact our Furnace Repair & Replacement Company today. We will schedule an appointment for one of our HVAC professionals to come to your home at your convenience. We look forward to working with you.